Evo Morales spent 10 minutes of his high-level speech decrying the confusion and disorganization unique to the Copenhagen talks. It is strangely reassuring when a well-known head of state feels the need to continue in this vein for nearly a quarter of an hour. Throughout the last two weeks, I had no idea what was happening; I was lost, confused, and upset that I could not contribute more. I couldn’t make heads or tails of my situation; I stood in long lines and was daily criminalized; and when I finally understood the process, I was booted out of it along with the rest of civil society because someone had not adequately capped the number of accredited observers. Police arrested peaceful demonstrators, invaded the university, surrounded crowds and then bludgeoned them–generally for no real reason, other than the fact that no one knew what was happening. I walked away from this feeling like a total failure, but when I compared stories with everyone else on my delegation, and in the youth movement, we all felt the same way. The feeling was absolutely universal, for civil society and party members and heads of state alike. Evo Morales was confused, Obama left with an air of depression, and even the Secretariat of the UNFCCC was beginning to show the signs of strain when he confronted a crowd of angry protestors who had been blocked from entering the Bella Center. I support YOUNGO, but I am not sure we were any better organized. There were no systems in place, no method of response, no chain of command. There were so many of us that we either overlapped roles and got in each others’ way, or else we sat around bored with nothing to do. If you had an idea, someone had already thought of it. If you wanted to take leadership of a project, someone more experienced would already be in charge of it. Thus, for 85% of participants, our role seemed to be confined solely to standing around, showing strength in numbers. Maybe that was part of the reason we failed as a planet. No one knew what to do, and it was impossible to take charge. Our hostel didn’t make matters much less confusing. We were denied wifi access (all other hostels in the region seemed to provide this) and habitually treated condescendingly by the staff, like elementary school kids. I have written a scathing review right here, if you would like to hear the obscene details. I don’t have a lot to go back to in Cincinnati. I had hoped that Copenhagen might somehow point me in the right direction, but that seems to have just been part of the larger Hopenhagen pipe dream. I do have a renewed sense of mission–it really is time to reach out, raise awareness, and start a movement. Not a hippie movement; I’ve had enough of that over the last two weeks. No, I mean that we have to mobilize citizenry to start thinking of money-saving alternatives to insane consumption and to start thinking across national borders. We need greater participation in the local system rather than this confounded Rube Goldberg machine that we call globalization. We need to find our pleasures and our meaning in the smaller aspects of life–not our brand-name clothes, not our number of Christmas presents, not our meaningless but well-paid occupation in corporate America. My sense is that it is time to love and forgive, heal old wounds, and make peace with life, because we don‘t know what tomorrow is going to look like, or indeed if such a thing exists. This will be my last entry. This blog has served it’s purpose; I hope one day someone can use it as a reference on how to run a one-woman show, on the UNFCCC process, or what to expect at a COP. It may also be read as a testament to human failure and futility. I don’t want to leave you on such a fatalistic note. Instead, I want you to join me. Get involved in a local group. Write to your lawmakers. Send me a message! Reach out to other people and get them involved–they need you. Help me in my ambition to live and die with dignity. I don’t think I can adequately respond to recent Copenhagen events, which is why I have not. By now, you have undoubtedly heard of the unneccessary piece of UN greenwash that Obama tried to tout as a successful agreement. That’s a lie. There was no successful agreement, at least not in terms of being science-based and legally binding. I watched Obama give his final press conference before heading back to Washington in which he was noticeably depressed. Maybe, like the rest of us, he felt like a failure for not having been able to do more. In the Copenhagen accord, no targets are agreed upon, no numbers are mentioned, no limits are set. What we have are three pages of vagueness which, for all intents and purposes, do not move beyond what nations agreed to 17 years ago. You can read the Copenhagen Accord here and judge for yourself–does it suffice? This is a surprise to nobody. We knew there was no hope for Copenhagen. We knew we fought for a lost cause. We watched as civil society was excluded from the talks while powerful nations made opaque and underhanded deals at the expense of the poor. We observed the inevitable failure of mankind’s last, best hope to save itself. Prior to Copenhagen, there was a massive public outreach. The talks were all over the news; activists and concerned citizens around the world pressured their lawmakers to come to an agreement. One hundred and nineteen heads of state committed to taking action. Posters of “Hopenhagen” were put up around the world. The television ran ads to promote a UN conference, for God’s sake; and STILL we couldn’t work out our differences in order to save ourselves. To me, this conference has proven what I already knew. Governments are not going to solve our problems. Only we, the people, are going to solve problems. Like Copenhagen, this is now a matter of hope, dreams and chance, and my only question left is, Are we feeling lucky today? As we sit in Oksnehallen Hall, we are keenly aware that, unless a miracle happens within the next several hours, the talks at Bella Center have all but failed. I don’t care if I’m being too negative–that’s the truth, and everyone here can sense it. We have tried to protest–which is not always easy to do when you are denied access to your own leaders and delegates. 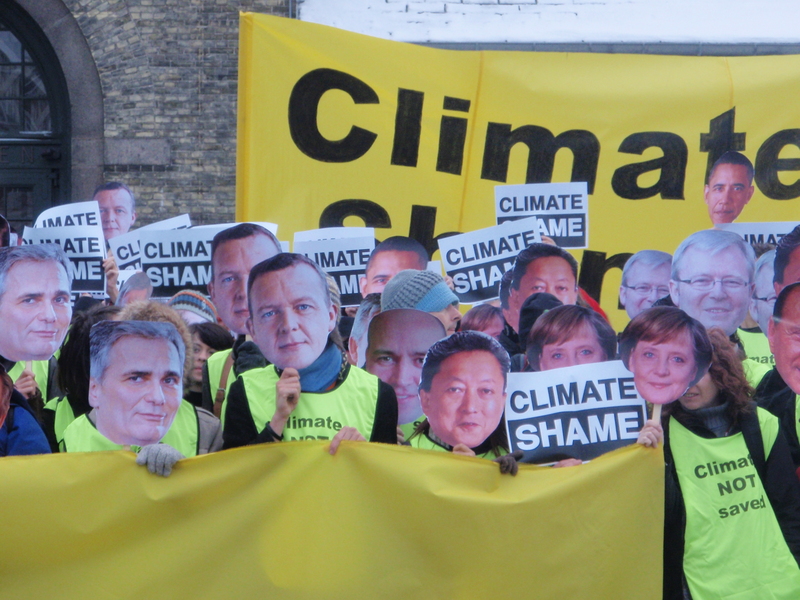 We formed a giant crowd dressed as our heads of state (I was Angela Merckl for some reason)–a giant wall of shame. Others of us protested by shaving their heads–to shock the world with “sudden change”, show the ugliness of the UN negotiations, or show the level of committment and a willingness to sacrifice needed to avert global catastrophe, depending on who you ask. We were also planning on having a candle-light vigil in front of Oksnehallen, arially spelling out the words “CLIMATE SHAME”. The police, who have been generally awful to NGOs and protestors over the last two weeks, have refused. No reason was given. I am truly disgusted. I can now hear the sound of many rotors. Fact–helicopters have been circling KlimaForum for the last several days…criminalizing the folks who just want to make the world a better place. Maybe they should be circling the Bella Center instead, seeing that that’s where the criminals are. Yesterday I fasted in solidarity with the Climate Justice fasters and those who will go hungry as a result of climate change. Maybe it was because I didn’t eat that my day seemed to be a lot worse than it actually was; I don’t know, but I won’t bore you with the details. 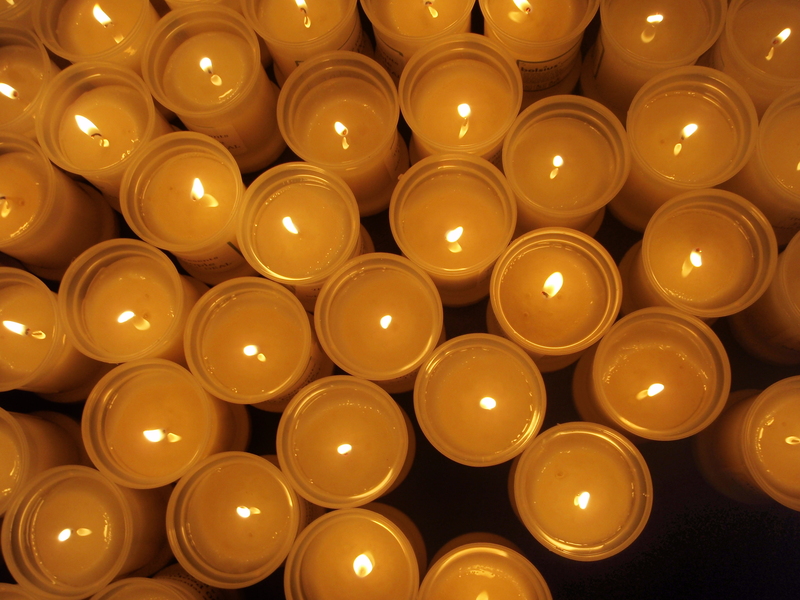 I will, however, bore you with my discussion of the candle-light vigil. Since we have been effectively booted from the Bella Center and whole UN process at this point, we have commandeered a hall at a the University that is hosting KlimaForum. It’s almost as good–there is a reasonably-priced food venue, chairs, internet service, and giant screens with the ongoing negotiations projected on them. 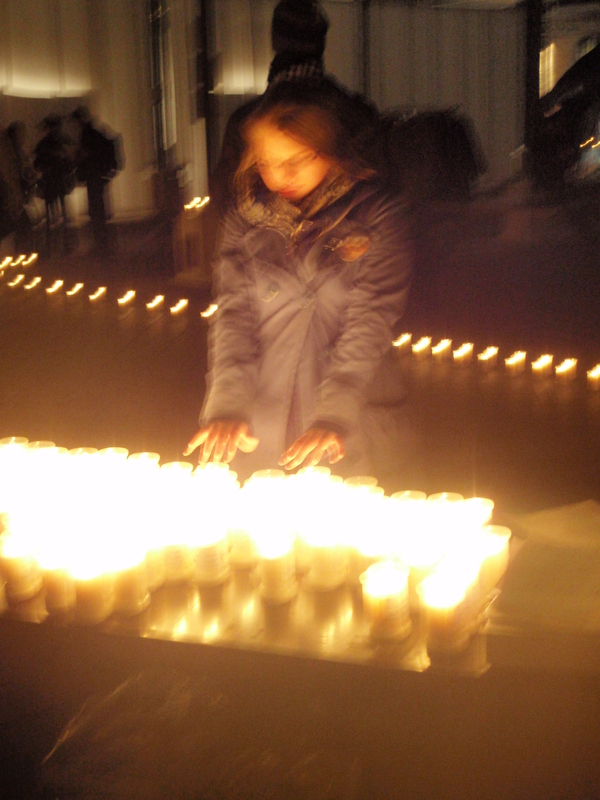 This was where we held the candle-light vigil last night. It was from 5-7, but I showed up quite late due to some of the drama that happened earlier in the day. Anna, who has been fasting for 43 days, said a few remarks as did a representative from an AOSIS state. 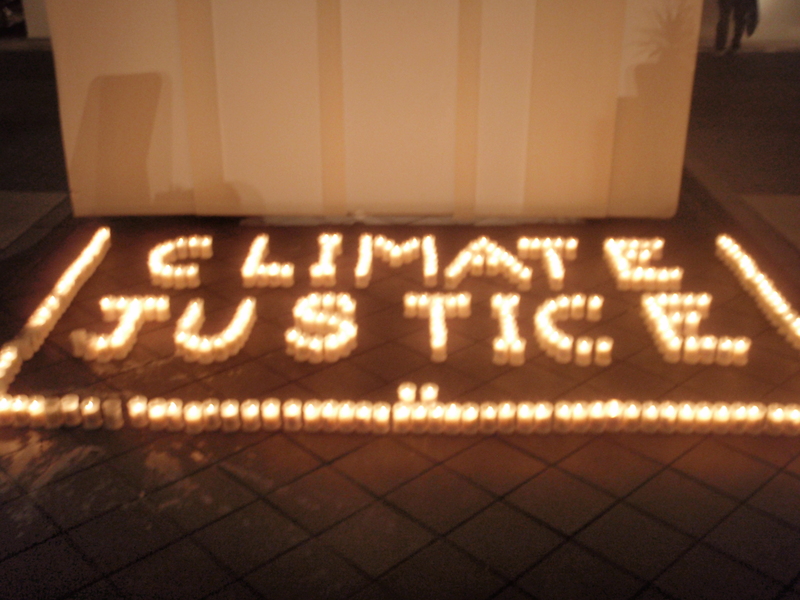 We lit candles and formed the words “Climate Justice” out of them. There were candles everywhere. They filled the dark room with light and warmth. It was beautiful. It was a time for quiet contemplation, but I didn’t have much time to reflect. Call me a wimp, but the lack of food made me feel perpetually awful yesterday, culminating with a throbbing headache, nausea, fever, and chills by the end of the day. I felt like I was about 100 pounds heavier than I am, and could hardly stand up by 10:00 pm (I’m better now). I habitually don’t eat on some days, but this was by far the worst. My admiration to those who, like Anna, have been fasting since early November. I guess that is sort of a physical type of contemplation, though; people the world over feel perpetually hungry and rotten like this…maybe one day there will be a global crop failure and I too will go through the same. Maybe everyone should be required to fast and then be told that if they don’t change their ways, they’re not likely to have a choice next time. The solidarity fasters were certainly not alone. Many prominent people chose to support us as well, including Naomi Klein, the many delegates from AOSIS and African nations, and of course my heroes Vandana Shiva, Bill McKibben and President Mohamed Nasheed. To participate in something when your heroes are right there next to you really makes you feel like a part of something larger, and even though it sucked at the time, I am glad we went through with it. I am fasting today, along with most of my delegation and thousands of other people from the world. We stand in solidarity with those who have been fasting for climate justice since November 6th. We wish to show that we are willing to put certain aspects of our current lifestyle aside to help heal the world; we fast to recognize the fact that many people will go hungry due to the effects of climate change and desertification; we fast because it is a very powerful way of making a statement. It is also a very personal action. The fast is a time for deep reflection on ourselves and the world. Physically, it affects each of us differently–it’s generally quite simple to do; but for some people (like myself) it’s very painful to go hungry and leaves the participant feeling weak, shaky, and cranky by the end of the day. For these and other reasons, fasting isn’t something everyone can agree to. For some, it is very radical and extreme. To others, it promotes self-harm, or seems to be a form of manipulation. I personally feel that if our countries don’t care about–or even take notice of–the masses thirsting and starving in Kenya, then they certainly will not care or notice the few who have been fasting since November. The actions seem both excessive and futile in my mind–although I have met the climate justice fasters, I admire them nevertheless; and although I am resistant to the idea, I think someone probably needs to do this. I therefore will affirm my support and solidarity for justice, leadership, and morality in these changing and difficult times by joining the day-long fast. Please join us, if it appeals to you and would like to support us. The way things stand right now, the negotiations are teetering between total collapse and a greenwash photo-op, according to the briefing I received by a Friends of the Earth member who addressed us here at the Fresh Air Center. NGOs have now been totally blocked from entering the Bella Center, even with a secondary badge. Like I said, I’m not inside the Bella Center today. I might have been, if the civil disobedience that was being planned had turned out. The US youth delegation was planning on sitting in on the US Delegation Office and declaring itself to be the new negotiating team, then announcing the correct mitigations targets needed to prevent the climate system from imploding (since the US is the world leader, no one will commit without the US committing first). We would have dressed in our most professional clothes and refused to leave until security guided us out. It would have been peaceful and functioned as one last hurrah before we are shut out entirely tomorrow. This idea came from an international youth idea to take over the US Delegation Office, but this would have looked really bad on their part in the international media; their message would have easily been lost. Therefore, we decided we needed an American core, with the support of all international youth–who would accompany us, not be subject to getting kicked out or arrested. I would totally have supported this and been willing to sit in the line of fire. When my future is so callously tossed aside in the interests of petty things, risking arrest and being permanently kicked out of the UN (even if one day I do want to be a diplomat) seems pretty unimportant to me. But–our action was hijacked. It was twisted from its original statement to become an action in which international youth sit down in the US Center and make a list of demands. The US Center is not the same thing as the US Delegation Office. The Center is an informational section right next to the EU Center, and is generally open to the public; it is used for presentations; the diplomats don’t hang out there. All symbolic meaning was effectively lost by doing this. Moreover, the US youth delegates no longer would no longer have been doing the taking over. International youth had protested that they should have a role–which they should, but to include them in the takeover would have conveyed the image of rowdy anti-Americanism. Great messaging, guys. Then, the message was further lost by trying to combine the protest against the US with a protest against Canada. For those who are unaware, Canada has a terrible record regarding climate change action. I can see that, and see that it needs to be addressed–but let’s not forget that they, too, are hiding behind the US as an excuse not to act. The US needed to be the target here. I don’t pretend to be an red-necked uber-patriot, but what really set me against this was when the folks who had been hammering out the details–neither of whom were American–declared the US negotiating team to be “incompetent” and called the US Center the “Propaganda Center” multiple times. (It’s sort of true, but come on–every piece of literature you will receive in the Bella Center is some form of propaganda.) Saying it once would have been funny. 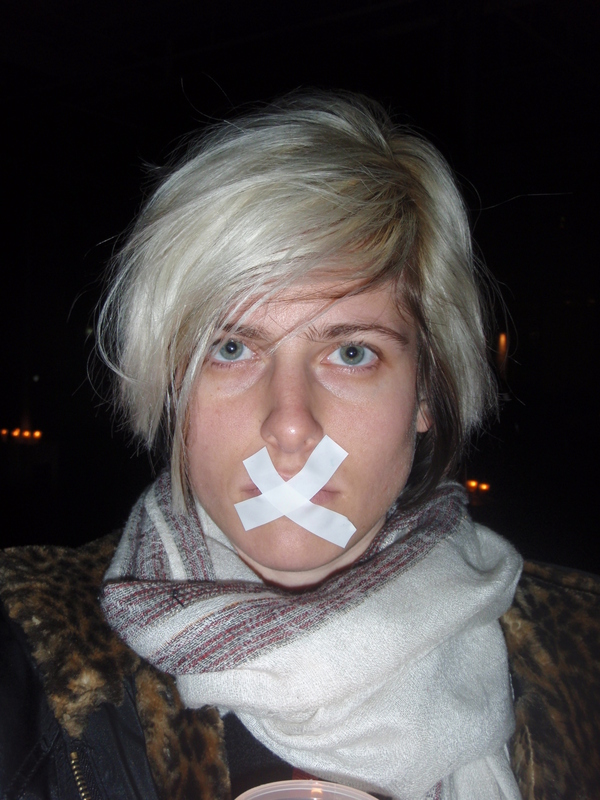 Saying it multiple times–especially by a non-American–was really offensive to me as a US national. That was incredibly insensitive–about 1/3 of those in the meeting were Americans. Furthermore, the US negotiating team hardly qualifies as incompetent–they simply can’t negotiate beyond what the government allows. We’re briefed on respecting the nationalities of others when we come to these events–maybe other countries should learn to do the same. I also noted that almost no one from the global south (who will most keenly feel the effects of climate change) was represented in this potential action, and I got the feeling that this was turning into some sort of “arrogant European*” radical anti-American action. The discussion was so badly split on this issue that I took the opportunity to leave. I don’t know whether it will ever materialize, but I for one will not be a part of it. I’m not sure why I just spent 700 words telling you this, but it sheds light on what it’s like to work at a COP as a youth delegate. With all of our energy and idealism, we too stood on the brink between total collapse and a greenwash photo-op. High pressure didn’t matter; politics got in the way of what was necessary. The End. *I don’t think Europeans are arrogant, by the way, but since they wanted to call spades for what they are, then so will I.
I’m sitting here in the Fresh Air Center (read: NOT the Bella Center). There weren’t enough badges to go around this morning; seeing that my role here has been utterly useless, I gave my pass to someone who actually had something to do inside. I do wish I was inside though. I really do. As I understand it, the NGOs just got up and walked out the center in protest. Just now. Friends of the Earth and Avaaz have been denied access to 100% of delegates today. The Bella Center metro stop is shut down in interests of “crowd control”. One delegate has cleared security but now will not be signed into the Bella Center. He is a parliament member of some European country, and he refuses to leave and is now sitting in and getting arrested to protest. Good for him! Diplomatic immunity! The President of COP15 just resigned proceedurally. The police have invaded the YOUNGO convergence space. What the eff?? We’re a constituency organization. That is an outrage! They’re all over the university, though. Fights are breaking out around the Bella Center. And that’s how I spent my morning! !